In analyzing data, you may be dealing with thousands, millions or even billions of records. As you perform computations to gain insights, you'll likely do lots of data transformations. With each computation, to save even seconds or minutes can be greatly helpful for you to deliver insights to your team faster and ultimately get more work done over time. With parallel programming in Python, you can do just that. Parallelism (aka parallel programming) is when two or more tasks run at the same time. There's important terminology to understand regarding parallelism too. A thread is an execution context for code. A process is a program and state of all threads executing in a program. One process can have several threads running at the same time. One program could also have several proccess running at the same time. In Python, by default programs run as a single process with a single thread of execution; this uses just a single CPU. 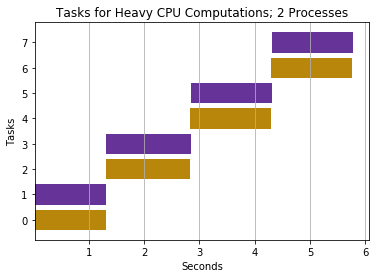 The CPU (central processing unit) manages the computational work of the computer. CPUs have one or more cores which allow for code to be executed simultaneously. My Macbook Pro has 4 cores. A single core can perform a number of computations in a limited amount of time. However, if a Python program uses another process running on another core, we greatly decrease the program's runtime. CPython (the standard python implementation) has something called the GIL (Global Interpreter Lock); the GIL prevents two threads from executing simultaneously in the same program. However, two threads can run concurrently and one can run code while another may be waiting. The GIL limits parallel programming in Python out of the box. 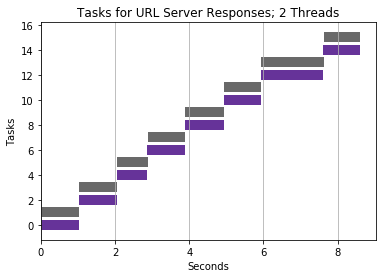 Threads are typically best for IO tasks or tasks involving external systems since threads work well to combine results quickly. On the other hand, processes need to pickle their results and therefore take more time to combine results from multiple processes. 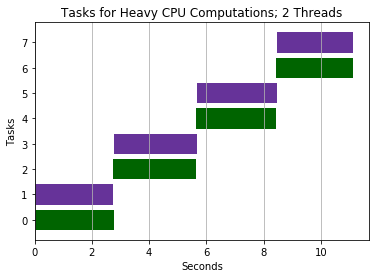 Threads provide no benefit for expensive CPU tasks since threads must run within the GIL. 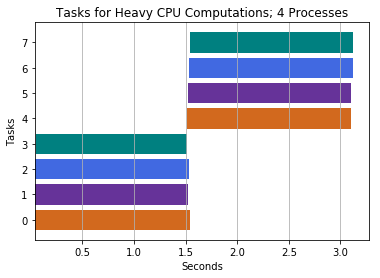 Multiple processes can speed up Python operations that are CPU intensive because they can utilize multiple cores and avoid Python's GIL. The use of map will be applied in our parallel programming examples later; so I'll provide a brief introduction now. Below I wrote a function called number_times_two to take in a number, multiply it by two and return the result. map is a built-in Python function that helps us easily apply a function over every item in an iterable such as a list. We'll use the map function to apply number_times_two to every element in the list of numbers [1, 2, 3, 4]. This table illustrates the operations that will take place. The map function returns an map object that is an iterator. We can call the built-in list function to output our result, the map object, as a list. These functions below will help us visually illustrate the effect of multithreading so it's easier to understand. Maps a function across an iterable (such as a list of elements) with the optional use of multithreading. Maps a function across an iterable (such as a list of elements) with the optional use of multiprocessing. Therefore we'll know how far timestamps are from the 0th second, the start of the program. Use Matplotlib module to create a horizontal bar chart of the time elapsed for each task. This is a popular example on the web. For a long list of URLs, we'll use the requests module to get a response object. With this response object, we could later perform operations to see the status of the request, get the contents of the site and more! First, just to illustrate our multithreading function, I'll call the multithreading function relevant to this example. We'll be return a list of nested lists, in which each nested list will contain the start timestamp and end timestamp of each task - each task being getting a new server response. In the visualizations below, each color represents the use of one thread in the operations. So for multithreading with two threads, you'll see two color bars, one for each thread. 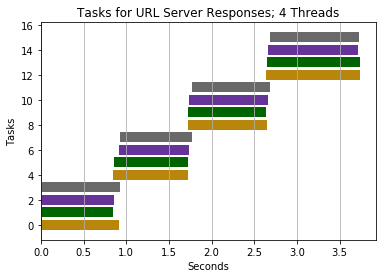 Let's visualize the effect of multithreading with 4 threads. In the visualizations below, each color represents the use of one process in the operations. So for multiprocessing with two concurrent processes, you'll see two color bars, one for each process. 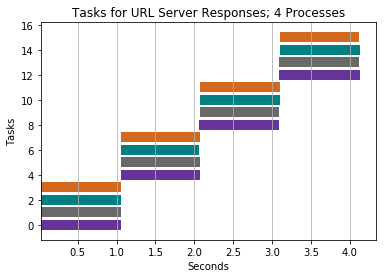 Let's visualize the effect of multiprocessing with 4 concurrent processes. 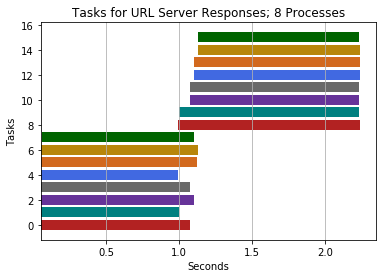 Let's visualize the effect of multiprocessing with 8 concurrent processes. Now, let's perform the same operation without the overhead of setting up multithreading. Conclusion: both multithreading and multiprocessing complete much quicker than a single thread & program. 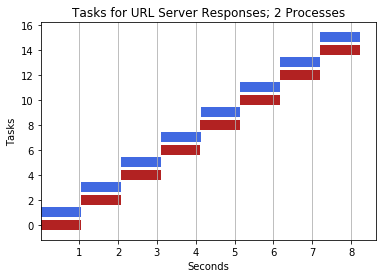 The reason parallel programming is much faster here is because the processor isn't working very hard to retreive the contents on the sites; however, the bottleneck is waiting for the site's server response to our HTTP request - an external resource. While one task is performing an operation of getting/waiting for a server response for one URL, another task can start for a different URL. Threads are also fairly quick to combine their results too. So if we were web crawling and constantly wanted to combine results from multiple crawlers, it'd be ideal to use multiple threads to spawn multiple web crawlers rather than multiple processes which take longer to combine results. Given this big list of numbers in big_list, we want to output a new list that has the square of all numbers in big_list. Think of this as a lot of small operations. Below I utilize code from another module of the Python standard library, multiprocessing, to perform multithreading for this operation. By default, we will use all available threads on our computer. Below I utilize code from the lower-level module of the Python standard library, multiprocessing, to perform multiprocessing for this operation. We'll use 2 concurrent processes. Conclusion: process completes much faster without parallel programming. This may come as a surprise that parallel programming hurts our performance here. Using parallel programming in Python or any other interpreted language with a global interpreter lock (GIL) can actually result in reduced performance if you're just doing a CPU bound task. This program must carry parallel programming's additional overhead of creating new threads or processes and synchronizing their results. In this example, we'll only perform 8 tasks - with each task requiring a large amount of math operations. Calculate the sum of all integer numbers from 0 to end_range_number. 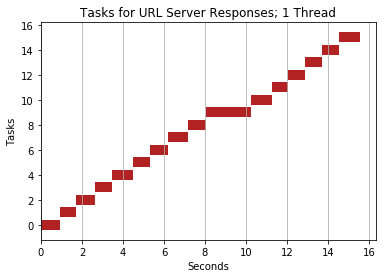 Let's visualize the effect of multithreading with 2 concurrent threads. Let's visualize the effect of multiprocessing with 2 concurrent subprocesses. Let's visualize the effect of multiprocessing with 4 concurrent subprocesses. Let's visualize the effect of multiprocessing with 5 concurrent subprocesses. The runtime of this program is the same as that of 4 subprocess above. But why? Well, there's no benefit to attempting to use greater than 4 sub-processes for CPU bound tasks because my laptop has just 4 cores - the ability to run a single process concurrently on each core. Conclusion: program completes much faster with multiprocessing at approximately 4 subprocesses running concurrently. 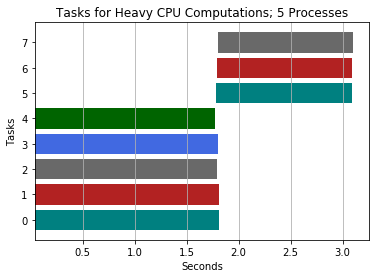 Multiprocessing here was helpful for this CPU intensive task because we could benefit from using multiple cores and avoid the global interpreter lock. Interestingly, spinning up additional subprocesses past 4 has no major effect on improving runtime of our program. Notice how the total program runtime with 4 subprocesses is equivalent to the program with 5 subprocesses. 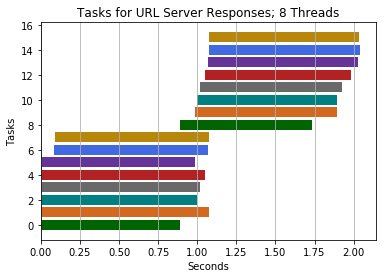 Threads provide no benefit in Python for CPU intensive tasks like these because of the global interpreter lock.